Just imagine - you are a young orca whale. Your special friends are two cousins and your 100 year-old great grandmother, the clan leader. You learn to play with them, face danger with them, hunt with them - and even go people-watching with them! Based on actual orca, or killer whale, research, this book combines science with the real story of how family, friendship, and a grandmother's love are helping this magnificent but endangered orca clan to survive. "Hodson’s debut introduces children to one matrilineal group of orcas living in the Pacific Northwest, an actual group of whales that has been studied by scientists for over 40 years…What will strike readers most is how familylike the whales are. Granny…has valuable knowledge of the waters and salmon habits, which she passes on…Hodson lightly sketches relationships among the group, the energetic Suttles and Mako both competing and sharing as they learn to hunt, and Ruffles offering a fish to the new mother. Backmatter tells of the real clan of orcas that inspired the story and fleshes out the information presented. Certain to get children interested in learning more about this endangered and very social species." 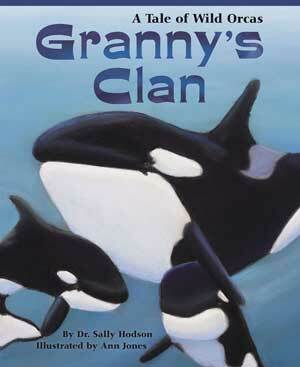 "Granny's Clan is a true story about orca whales, beautifully written by a whale expert. These majestic whales live in tightly knit family groups called 'pods' that keep in close contact by talking with one another. They are incredible acrobats who love to play. Granny's Clan is a wonderful book that shows how much we can learn from other animals. I highly recommend it." "Killer whales - orcas - are to the sea what we are to the land: intelligent, social, talkative, and playful. I love this story of Granny and her family, the J pod. Granny's Clan perfectly combines wonderful storytelling and beautiful illustrations to captivate young minds and help them to appreciate that every individual matters, every species counts. As my late father, Jacques Cousteau, used to say, 'people protect what they love.' After reading this story you will fall in love with orcas." Site copyright © Dr. Sally Hodson. All rights reserved. Website by We Love Children's Books.